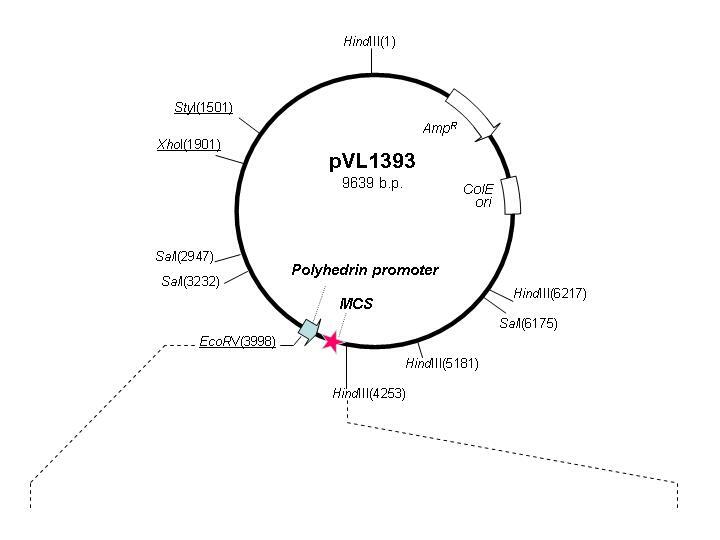 pVL1393 vector is a general purpose plasmid transfer vector which can be used for expression of any protein of interest in the polyhedrin site of the Autographa californica nuclear polyhedrosis virus DNA. 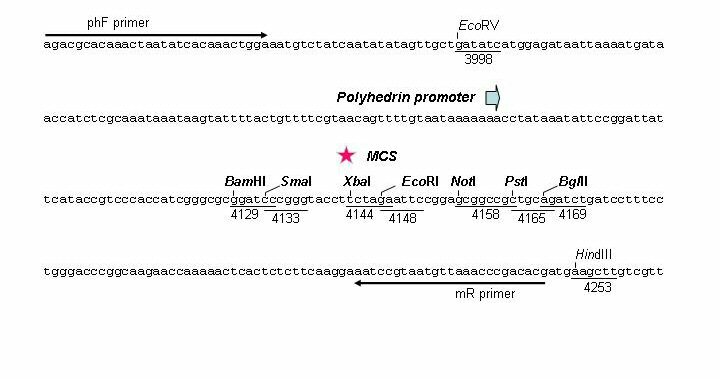 A PCR fragment encoding a protein of interest can be cloned in lieu of the polyhedrin promoter using any of the unique restriction endonuclease sites (bold) located in the MCS. Positions of phF and mR primers, which are useful for sequencing the insert/vector junctions, are shown on the DNA sequence as arrows. The above plasmid transfer vectors are compatible with linearized baculovirus DNA from several other suppliers, e.g. BacMagic™, BacMagic™-2, BacMagic™-3, BacVector™-1000, BacVector™-2000, BacVector™-3000 (Novagen); BaculoGold™, BaculoGold™ bright (BD Pharmingen); flashBACGOLD™, flashBACULTRA™, flashBAC™ (OET); BacPAK6™ (Clontech); Sapphire™ (Orbigen). They are not compatible with Bac-to-Bac® and BaculoDirect™ DNA from Invitrogen. BacMagic™, BacMagic™-2, BacMagic™-3, BacVector™-1000, BacVector™-2000, BacVector™-3000 are trademarks of Novagen; BaculoGold™, BaculoGold™ bright are trademarks of BD Pharmingen; flashBACGOLD™, flashBACULTRA™, flashBAC™ are trademarks of OET; BacPAK6™ is a trademark of Clontech; Sapphire™ is a trademark of Orbigen, Bac-to-Bac® and BaculoDirect™ are trademarks of Invitrogen.